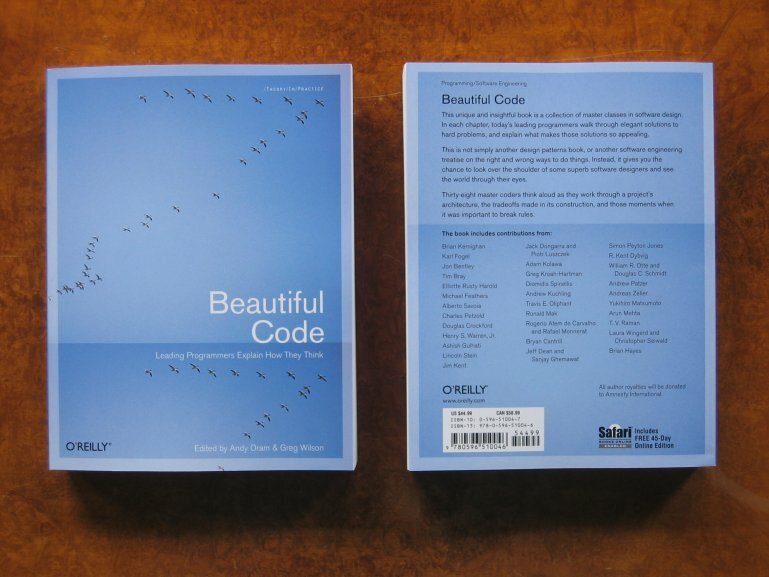 July 21, 2007 by Karl Fogel 1 comment on "“Beautiful Code” has arrived…"
Appropriately, the book itself is physically beautiful. And big: at 600 pages, I haven’t read most of the chapters yet. But I’ve been skimming a lot, and diving deep in some places. It’s already my favorite new computer programming book of the year, indeed of the last few years. I could name many chapters that delighted me, but lists of recommendations make the eyes glaze, so let’s go with just one: Chapter 24: Beautiful Concurrency, by Simon Peyton Jones, which was so absorbing it nearly made me miss my stop on the BART going to Berkeley the other day. I haven’t nearly read all 33 chapters yet, of course, so take that as an absolute recommendation, not a comparative one. Congratulations to Andy Oram and Greg Wilson, the two editors. This one’s a keeper. July 14, 2007 by Karl Fogel 22 comments on "What Would Euler Do?" 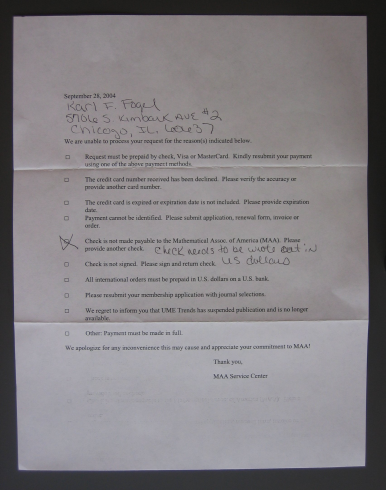 I was going through a pile of papers today and found some old correspondence with the Mathematical Association of America. Maybe they meant it to be a receipt or something? Oh, how I wanted them to deposit it! But they didn’t even try; they sent the check back uncashed. 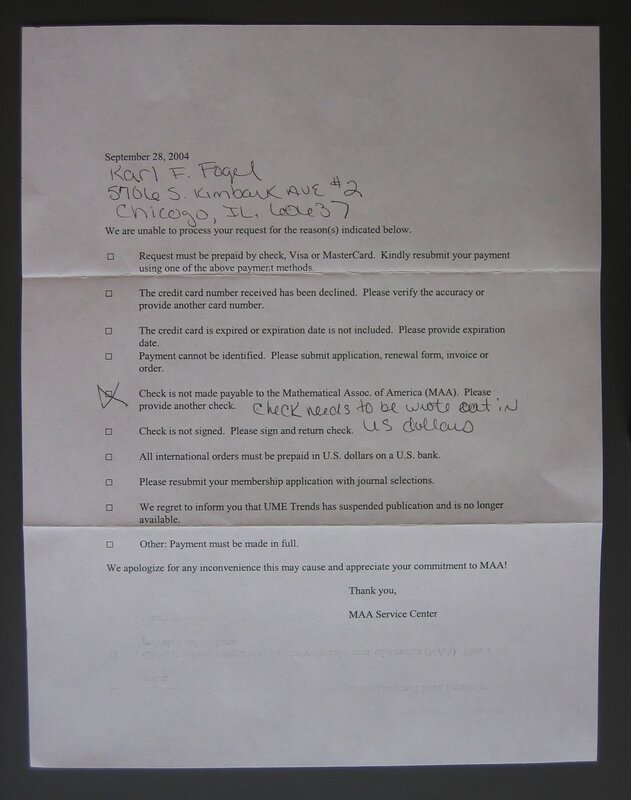 Maybe the MAA is using one of those accounts-receivable clearinghouse services, and it isn’t really their fault. 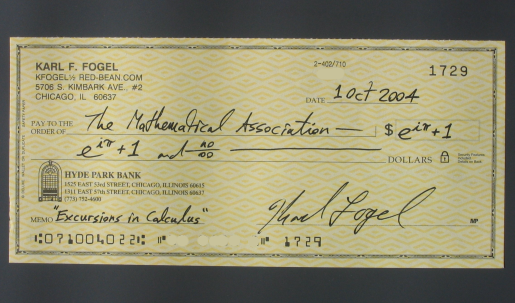 But if you can’t write a check for eiπ + 1 to the Mathematical Association of America, whom can you write one to? 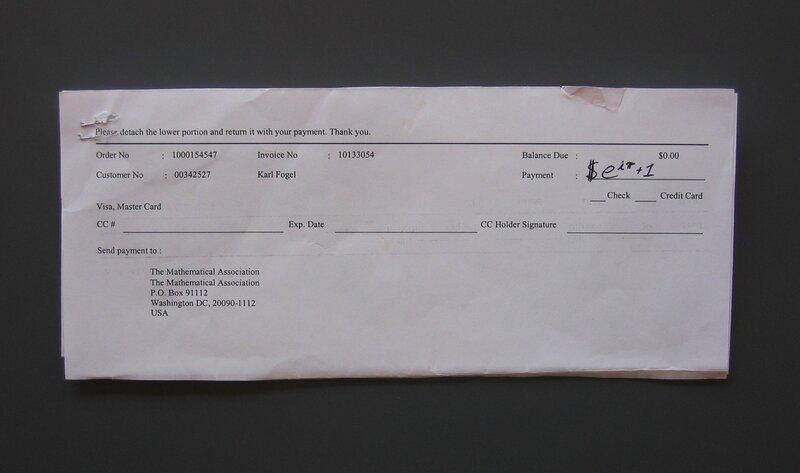 The handwritten reason for the rejection was totally lame, too: “check needs to be wrote out in US dollars” [sic]. But it was in U.S. dollars! 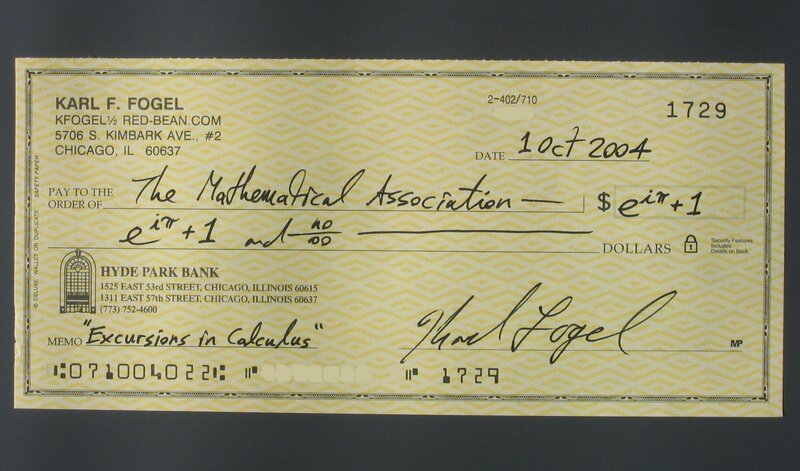 Sheesh, it’s like they’d never seen a π-dollar bill before or something. July 13, 2007 by Karl Fogel 4 comments on "Go see Will Franken. Now." If you live in or near San Francisco, please go see Will Franken‘s show at The Marsh as soon as you can. It’s running until August 4th, and it is staggeringly, mind-blowingly brilliant. My friend Lev and I just saw it, and afterwards we could talk of nothing else except how amazing it was. Here is a map of the area around the Marsh. Their ticket hotline is: +1 (800) 838-3006. Ticket prices are on a sliding scale from $15 (“I’m unemployed”) to $35 (“I just sold my startup to Yahoo”). The show is on three nights a week: Thursday, Friday, and Saturday. Is there anything else I can do to make this easier for you? Arrange a limo to pick you up? Will Franken doing comedy is what Paganini playing the violin must have been like: a master so completely in control of his instrument, his material, and his art that you can only sit in silent, reverent awe. Except that in Franken’s case, you have to sit in silent, reverent awe while simultaneously breaking into uncontrollable fits of side-splitting laughter. You think that’s easy? Try it — I almost cracked a rib. In the 19th century Robert Schumann, a music critic as well as a composer, apparently made a habit of proclaiming a genius under every rock. Too often he hailed the merely talented as something greater than what they were, so that even when his judgement was sound (as with Chopin) it wasn’t taken seriously enough: a case of the boy who cried wolf a few too many times. I’ve tried hard not to engage in that sort of review inflation. If you search my blog for the word “genius”, you won’t find any matches before this post. Please understand: this is the moment I’ve been hoarding my credibility for. This is it. I’m cashing in. Will Franken is a genius, a creative artist like no one else I’ve ever seen. He deserves to be world-famous; perhaps he will not be, for the same reasons that American Idol is popular, but if so, don’t let it be because you didn’t go see his show. I feel dirty even calling it “comedy”… it’s something much deeper (and therefore funnier) than regular stand-up comedy. Many comedians make a good show out of saying the things we all want to say, but don’t because we’re afraid of what other people might think of us. Will Franken makes a great show out of saying the things we don’t say because we’re afraid of what we might think of ourselves. July 11, 2007 by Karl Fogel 13 comments on "Answering Augusto…"
A student named Augusto Pedroza posted a comment here recently, a comment containing such a large and complex question that I’ve decided to use this separate blog entry to answer it. The answer, I think, is “everything”. But that’s just an assertion, not an argument. Augusto’s going to need some more details to back it up. Below are his questions, with my responses interleaved. I’ve been following [QuestionCopyright.org] too. I already read this one: The Promise of a Post-Copyright World. The more I read things about patents, copyright, open source, free source, few questions arise. Maybe you could share some of your points and perhaps indicate some articles that you might find interesting. My first question is: In what extent are patents, copyright important and necessary? Is it fair that a company or a person who invests precious hours of his own time make his work freely available? or even worse, his new idea might give to well established companies a way to explore a new idea and make a lot of money?. In the other hand is it fair that a company that finds a cure for cancer may be able to patent that to make money while thousands of people suffer and die from this sickness?. I guess in matters of software my question really is, what should be allowed to be patented in order to avoid this huge mess caused by a current poor patent system? First, when a person releases a work to roam free in the world, the person always gets a benefit from that work: the benefit that comes from being the creator of something people enjoy or find useful. This isn’t just some abstract feeling. I’ve written two books, and in neither case was the monetary reward significant enough to be a motivating factor (in fact, I made a lot less than U.S. minimum wage for the hours I worked). But the books were still very much worth it. They have helped me in concrete ways: I’ve gotten jobs, speaking engagements, conference invitations, etc based on them. Only accurate attribution is needed for this effect to take place, and attribution is unrelated to copy restrictions. Actually, for attribution purposes, it’s much better for the works to be allowed to flow freely on the Internet. Second, be careful not to confuse “free” in the sense of “everyone has the freedom to copy and make derivatives of the work” with “free” in the sense of “doesn’t cost money”. Most artists don’t earn much money from their work anyway, but those who do mostly earn it from grants, commissions and performance revenues, not from copyright royalties. Even for non-performing, non-grant-seeking artists, there are other ways to fund their work that don’t interfere with others’ freedoms (for example, see the Threshold Pledge system). It’s true that some artists do earn significant amounts from copyright revenues. But don’t view that as a matter of “fairness” or “rights” — view it as one possible business model out of many. There are other ways artists can and do make money. For example, in the U.S. we don’t do very much taxpayer funding of art; other countries do. Whether or not to fund art through taxes is a decision every taxation group (i.e., nation) must make for themselves. But it’s not a question of fairness, it’s just a policy question. And what I’m saying is that copyright itself is also just a policy question. Copyright enables a particular business model: a model based on centralized distribution with restrictions on copying. That business model is inherently incompatible with any business model (such as being a DJ) that relies on unrestricted abundance. So we must decide, as a matter of policy, whether we want freedom and abundance, or control and artificial scarcity. …few workers receive salaries that approach the total value of what they produce. The social value of the work performed by the man who invents the supermarket, the man who clears a swamp, the academic scientist, or the schoolteacher may be much greater than his pay. Moreover, workers in competitive industries make products that sell at prices well below what many of their buyers would be willing to pay for them. We do not feel that owners, managers, or workers in such industries are for this reason morally entitled to higher wages. Indeed, when a worker without competition â€“ perhaps because he is the only doctor in the area, or the only engineer capable of building a certain bridge â€“ could charge a price close to the total value of his services to the buyer, we normally encourage competition, which will force him to charge less. There is nothing inherently immoral in the fact that many workers are paid less than the social value of what they produce, for much of the excess of social value over persuasion cost is transferred to the consumer in the form of lower prices. It is not apparent that the producer has any stronger claim to the surplus than the consumer or that the authorâ€™s claim is any strong than that of other workers. In fact, why is the authorâ€™s moral claim to be paid more than his persuasion cost any stronger than the claim of others also responsible for producing his book: the publisher, the printer, the bookseller, and those responsible for the literature in the past that inspired him? In sum, simply to speak of the “fruits of one’s labor” does not show that the author should be paid more than his persuasion cost or how much more he should be paid. In particular, it does not demonstrate that the amount he receives under existing copyright law is any more “just” than what he would receive without copyright protection or under a different copyright system. It’s interesting that we do not ask this “fairness” question about, say, road workers or doctors. Instead, we observe that they are willing to do what they do for the wages they receive. In some cases we may feel those wages are too low, but this feeling is not dependent on the amount of benefit someone else reaps from the worker’s product — it’s dependent just on the wage itself. So, then, why is it “worse” when someone’s “new idea might give to well established companies a way to explore a new idea and make a lot of money”? Do you consider it “worse” when a trucking company makes a lot of money using the roads that your tax money built? 🙂 Is the originator of an idea worse off because someone else, somewhere, is successfully exploiting that idea to make money? I think we should treat creativity the way we treat most other activities that bring varied benefits to different people: by not assuming that one person’s benefit is automatically another’s loss. Life is not a zero-sum game, and neither is the world economy. Second question: In your opinion, is there a perfect time to open a source code in order to obtain success as well as be competitive? Had google opened their ideas and source code in the beginning of its existence it would not have created such an empire that is able so sponsor great programs as this one (gsoc). Is it possible to measure positive points and negative points if Microsoft for example, decides to open all their code right now? I am a big fan of open source development and I have been trying to understand these points in order to show how companies fully based on the proprietary model are able to see their companies as part of a community. I want to show them the risks, the advantages and of course this new exciting way of producing software. First of all, I agree that it is probably somewhat to Google’s advantage not to open up their core code — although the advantage is not that great. I suspect most of their market edge comes from their infrastructure and their processes for supporting it. Even if they did open up their code, most competitors couldn’t make much use of it, although perhaps those who want to game their Google rankings could derive some advantage, and spammers could better fight Google’s spam filters! In general, though, I’m suspicious of chains of logic that say “If Foo Corporation hadn’t done ABC, then they wouldn’t have made so much money, and then they couldn’t support wonderful programs like XYZ.” The same reasoning applies no matter what ABC is — it could be illegal monopolistic practices, arms dealing, whatever. So when you measure the “positive points and negative points” of someone opening their code, you have to ask: “positive” and “negative” for whom? For the company? For its customers? For society as a whole? By the way, I’m not making the argument that service providers like Google (and, to some degree, Microsoft) should be forced to open up their code. I do think certain applications should be open source by law (voting software used in public elections, for example, and software that controls medical devices). But the boundary between copyright and trade secret law starts to get very fuzzy, especially when dealing with companies whose software runs on their own servers. So I don’t think Google should be required to open their code. I’m just pointing out that your question, at least the way you asked it, contains an assumption that competitiveness (for a given company) is inherently good, that it should be a primary goal for society. Now, I know you were partly asking about arguments that for-profit business would be receptive to. There is no general answer to that. You just have to look at each situation and see. Sure, I could write a separate blog entry about the business case for freedom, but I wanted to stick to the social case here, as I think it’s a more important argument. There is no need to worry about business: clearly, for-profit activities can flourish in a world of unrestricted abundance of works of the mind. If someone claim’s they can’t, I’d like to hear why that means we should favor the profits rather than the freedoms! But in the end, it’s a false choice, because there is no conflict between freedom and economic prosperity. There is a conflict between freedom and certain business models. P.S. Most of these arguments apply to patents too, but not all of them. Patents and copyrights differ in some important ways. Regarding software patents, and perhaps other kinds as well, this post and this post offer some methods by which one can tell whether a given patent regime is useful to society or not.